Personalized Wine Jug Set (includes 2 19oz wine glasses)is the perfect set for any wine connoisseur. 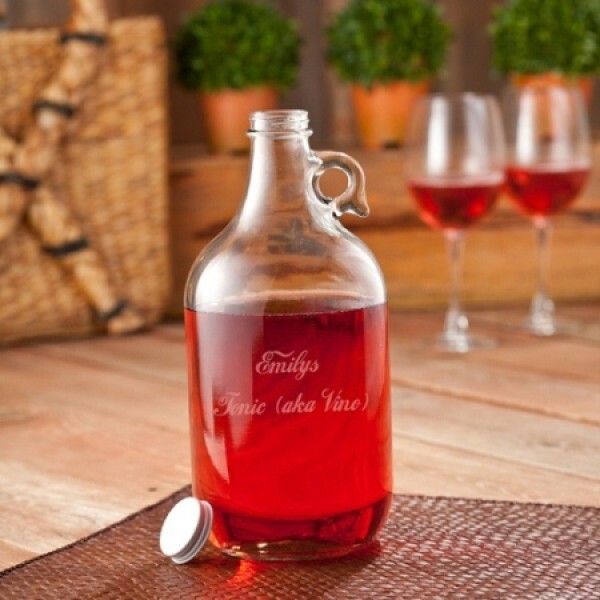 Securly carry 64 ounces of wine, lemonade, hot cider or any other beverage from the fridge to the table or from the car to the picnic. This classic jug is personalized with detailed etching so we know exactly who it belongs to. Arrives with 2 oversized 19oz non-personalized wine glasses for the perfect gift set. PERSONALIZATION: 2 lines up to 15 Characters Per Line. Wine glasses are not available for personalization with this set.